Conservation agriculture is an innovative approach for improving resource use in sustainable production. Its benefits include reduced inputs, more stable yields, improved soil nutrient exchange and enhanced long-run profitability. 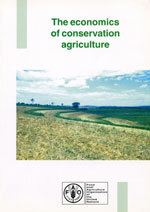 This study examines the financial and non-financial factors that affect the adoption and success of conservation agriculture at farm, national and global levels. Conscious of the possible divergence between private and social interests, it highlights the importance of farmers' objectives and motives, the collective dimension and the role of policy. In calling for improved policy analysis and information for decision-making, it recommends the development of sustainability indicators and a whole-farm approach to analysis.